Tifphanie Tucker, keynote speaker and author, has been selected from a nationwide search to be featured in Stepping Stones to Success; a highly successful book series from Tennessee based Insight Publishing. 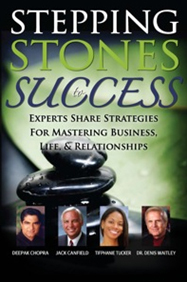 The book features best-selling authors Deepak Chopra (The Power of Purpose), Jack Canfield (Chicken Soup for the Soul), & Dr. Denis Waitley (featured in The Secret). Tifphanie Tucker, Chopra, Canfield, and Waitley, are joined by other well known authors and speakers, each offering time-tested strategies for success in frank and intimate interviews. Houses have many similarities and differences. From the outside, it is impossible to tell what their foundations are like. A storm could shake the house from the foundation if it is poorly constructed. While they may have visible similarities and differences, it’s important to look deep within and discover what makes up the core of the foundation. Now Tifphanie, a state certified licensed general contractor, shares how you can construct your life based on a foundation that will withstand life’s storms. In Women Under Construction, building a life is metaphorically compared to building a house, starting with a solid foundation, adding walls of virtue and working all the way up to the roof, using the teachings of the Bible as a blueprint to building a successful and productive life. Women Under Construction is a book that will inspire you to discover your own tools of determination, confidence, focus and spiritual fulfillment.